Based on the description in scriptures, idols and paintings of different Gods and Goddesses were developed and portrayed by our ancestors. 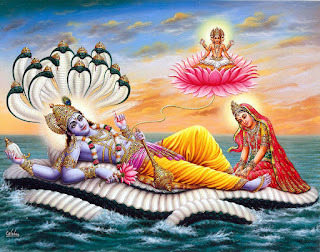 The painter portrayed Lord Vishnu like this - there is a sheer sagar (ocean of milk) with a bed of snakes, on which Maha Vishnu, the lord, rests. Sheer sagar is the blissful mind, the mind in which waves of contentment arise. The snake represents an awakened state of mind, kundalini shakti, that is within us. The consciousness rests in the blissful and awakened state of mind. There are three layers to it.The ocean of milk means that the environment is very balanced. Only when the environment is favorable can samadhi (deep meditation) happen. Even for the discussion of scriptures or to sit and think peacefully, one needs to be assured that the atmosphere is free from trouble. If there is a flood or earthquake around, then no one would read scriptures or talk of research and knowledge. Thus the ocean of milk represents a favorable environment. Until the depth of knowledge is experienced, it remains on the surface. No matter how many Vedantas one reads, it is important to have a favorable environment. When the kundalini shakti rises, the chaitanya shakti that lies within us, the infinite and eternal reigns. From the stomach of that infinite power, a lotus comes out effortlessly, from which Brahma appeared. Thus the creative power rose from there. A blissful consciousness gives rise to creative power. The greatest of scientists came up with new inventions, only when they were in rest. It is extremely vital for researchers and those who experiment to have a favorable environment, one without noise and chaos. You cannot ask someone to do an invention in two days. Invention is not bound to time and cannot take place in an unfavorable environment. It means that the body is transparent as if it was not there. Even Krishna, Shiva, Rama are depicted in blue. That doesn’t concern the physical body but inside is infinity. Whatever is infinity is represented by blue: sky is blue, ocean is blue, the great, the big, enormous depth and that bliss, that being- the soul. Padmanabha means whose navel is the size of lotus. Lord Vishnu is known as Sri Padmanabha. The navel is also called the second brain. There are two brains in our body. One is the head and the other, the navel. It is called the solar plexus. The work that brain does is supported by the solar plexus. Half of the work is done by it. That is why when the stomach is upset, mostly there is chaos in the mind, there are a lot of thoughts in the mind. So it is said, those who practice yoga sadhana have a blossomed solar plexus. Those who don't practice yoga sadhana have a solar plexus smaller in size like that of an amlakundalini shakti is fully, it is even bigger than an orange – it is like a blossomed lotus. (Indian Gooseberry). The solar plexus grows to the size of an orange for those who do yoga sadhana and meditation. Lord Vishnu is depicted lying down, and a lotus comes out of his navel, followed by Brahma. Creation came later, first the strength to nurture was born. (In Hindu philosophy, Vishnu is considered to be the sustainer of the universe and Brahma is considered as the creator of the universe). Many people believe that God is tired after working. No, no! For God, creation is effortless. Like for a housewife, making tea is effortless – she can talk, sing and still make the tea.